The biblical criteria for determining which animals are kosher, and their practical application today. Kashruth a compromise for Vegetarianism? What diet does G-d really want for us? We see that in the Garden of Eden both animals and humans are commanded to be vegetarian: Gen 1:29-30.According to Isaiah 11: 6-9,perhaps when the messiah comes we will return to a vegetarian diet. Rambam interprets these passages as a metaphor for world peace but peace begins with ourselves and how we treat everything around us, including animals. The language is so specific that animals will be vegetarian, surely it applies to humans as well. Perhaps Isaiah didn’t want to say that we will be vegetarian because he feared that our desire for flesh is so great that we would not look forward to the coming of the messiah. this video doesnt come up We are students of Rabbi Kaplan, we live in TX, attend an orthodox shul, going through conversion. I have 2 generations of Jews but all became catholics. Many others were listed on the death camp lists in France. Cant find any papers on anyone, so I choose conversion. My heart was Jewish from birth even being raised with Jewish hatred by mother whose father Moyses grandmother was Jewish. The spark has burned in my heart given me by G-d. I so love Him-- my husband & I and Hunger for more and more Torah and learning. We love Chabad.org and get most all our teaching here. If we ever get past our medical bills of late, we will send a gift of appreciation. Wont be much but it will be heartfelt. Kosher Which Is for the Soul This was very interesting, and as usual I learned. I love to listen to this man speak. 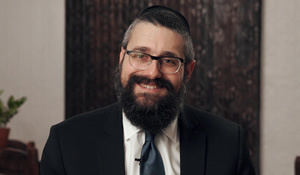 A Rabbi who is so sweet, has humor, is obviously extremely intelligent, as well as educated, is pure pleaasure. I am so glad I dicovered this site, and this Rabbi, Mendal Kaplan. Is It All About Getting Spiritually High? Lesson 2: Cows, Sheep and Chickens, Oh My! Can a Snake Become Kosher? The Transcendent Power of Obedience! You are What You Eat—in More Ways than You Think!